The Panzer II was Germany's first cannon-armed tank in the post World War I era. Designed and initially produced under the code name of 100-horsepower Farm Tractor, owing to the restrictions of the Treaty of Versailles, the Panzer II remained in production, and in the field, well after it had been surpassed by better engineered, more heavily armed and armored vehicles, and indeed played a key part in the early victories achieved by the Blitzkrieg. Almost 200 scarce wartime photos, illuminated by detailed captions, fill the 168-pages of this hardbound volume. I think it is perhaps the best and most comprehensive collection of archive photos I can remember seeing that is devoted to the topic of the Pz II. In one book you get interesting photos, which will be equally useful for modelers and military history fans. 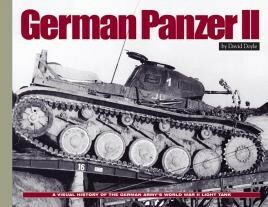 The photos are well chosen and illustrate the Panzer II in all the theatres…highly recommended. Almost 200 wartime photographs with detailed captions make this a book to treasure. This is a highly attractive volume for the modeller - some of the photos just cry out for a diorama.